Princess castle cakes - Unforgettable kids birthday cakes by Land of Cakes New York. 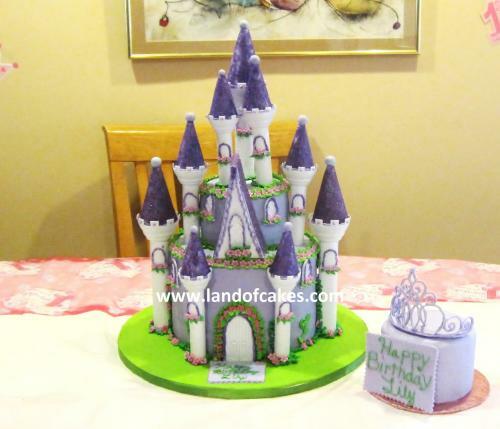 We design princess castle cakes for all ages and occasions from birthday parties to sweet 16s. Children love our custom castle cakes and we love making them. No princess birthday is complete without a castle cake made with your favorite cake filling. This particular 1st birthday princess castle cake was made of chocolate sponge cake and filled with a delicious cannoli cream filling - our special recipe. It stands at almost 18 inches tall and is big enough to feed over 80 people. Since this was for a kids 1st birthday party we included a special 1st birthday smash cake topped with an edible handmade princess tiara. You kids will feel like a princess with a specialty cake made by Land of Cakes New York.